This is what I’m hoping my feet will look like after Baby Foot, even without Photoshop. Spring is (hopefully) around the corner (I’m holding you to it, Punxsutawney Phil! ), but after months of late nights, too much alcohol and rich foods, indoor heating overload and dry winter air, my skin always gets super dry, flaky and even cracked. This is especially true for my feet, an area that is perennially drier than the rest of my body, and the situation is exacerbated every year I get older. So though I may never have baby-soft, photographable feet (it’s hereditary — thanks Mom), I have found a few ingenious methods that really work at sloughing, buffing and melting away my cracked heels (gross, I know, but hey, whatever works) so that my feet don’t scream “75-year-old grandma.” Disclaimer: Some of the “before” foot photos below are not Photoshopped. You’ve been warned. As soon as the weather starts getting really cold, I start scrubbing my heels with a pumice stone in the shower. 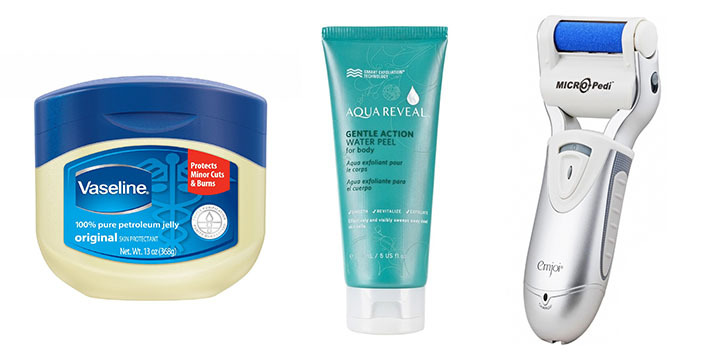 It’s the easiest way to stave off cracked, flaky skin, though I do notice after a while, it’s no longer good enough. At that point, I turn to the good ol’ Vaseline-and-socks method, which I’m not a huge fan of but will do when I get really desperate (which is right around now). I hate the way Vaseline feels on my feet, but it does help keep the cracking in check. My parents travel a lot, so I take all the airline socks that they pass out on a flight and use those to cover my feet, so I don’t ruin any good socks. For those who want more immediate gratification, Emjoi’s Micro-Pedi is a cool little tool that lets you gently buff the cracked skin away. The Micro-Mineral roller spins at 30 times a second — just apply to your heels and wherever your skin needs some tough love. It’s won the QVC Customer Choice Award for best body beauty device for the third consecutive year in a row, and it’s easy enough to use that you can just scrub away while watching TV. Heels are one thing, but it’s hard to buff away dry cuticles without trimming them, something experts say is not a good idea if you want to avoid possible infection. But even in the wintertime, I always keep my toes polished — after all, I live in L.A., and you have to be ready for open-toe shoes anytime of the year. I used to go to a salon to get my nails done, but ever since I found out about the lack of hygenic practices at nail salons (a friend of mine had to get a part of her big toe nail permanently removed because of an infection — yikes! ), I now do my own toes. Of course, if you’re anything like me, you get polish all over your cuticles when you give yourself a pedicure. My secret to looking like I got a semi-pro pedi is to dab Elizabeth Arden 8 Hour Cream Skin Protectant all around the cuticles right after polishing my toes and leaving it on overnight. Not only does is hydrate my rough cuticles, it protects the polish from chipping or getting weird blanket marks, and, even better, it makes it easy to pick off all your little nail polish mistakes the next morning. 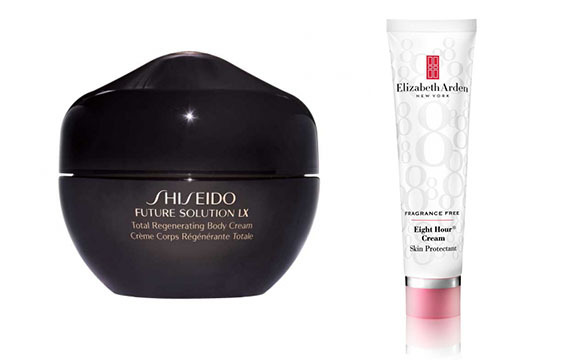 One body cream I wish I could bathe in if I could afford it is Shiseido Future Solution LX Total Regenerating Body Cream. According to Shiseido, research shows stressed-out skin has high levels of the protein Serpin B3. So they created this body cream, which nixes the protein and increases skin’s metabolism and microcirculation, while yeast, star fruit and okra promote collagen and hyaluronic acid. The proof is in the pudding: my super dry legs were never so soft in the dead of winter. Ah, but alas, $130 for a body cream is just not do-able for me. 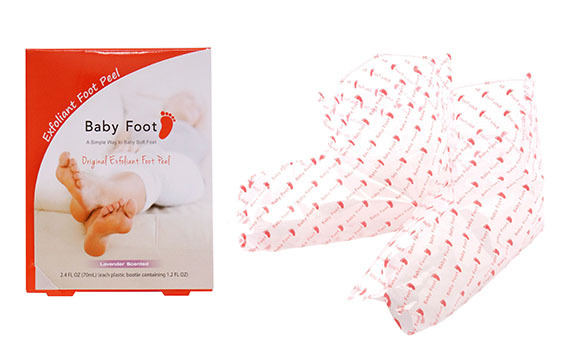 Sure, a little gross, but the baby-soft feet may be worth it. As soon as I build up my courage (and clear my calendar — no open toe shoes or visiting Asian households where shoes-off is a must for me for a while! ), I’ll try it and be sure to take photos to show you the before and after. Wish me luck! Wow, really? Thanks for letting me know. I think I definitely have to try it, but I am having the hardest time figuring out when I have like 2 weeks where I don’t have to show my feet, especially now that the weather is warming up, and especially since I’m Asian and we take off our shoes in the house! How did you deal with that aspect of it?